A lot of you may have seen in a recent post that I received the Real Techniques Duo Fiber Collection off my Mum for my birthday (thanks Mum!) and after getting to grips with these brushes I thought it was about time I reviewed them for you all! The Real Techniques Duo-Fiber Collection is designed to create buildable colour and to add texture in order to look pixel perfect for any occasion with the first ever duo-fiber collection. 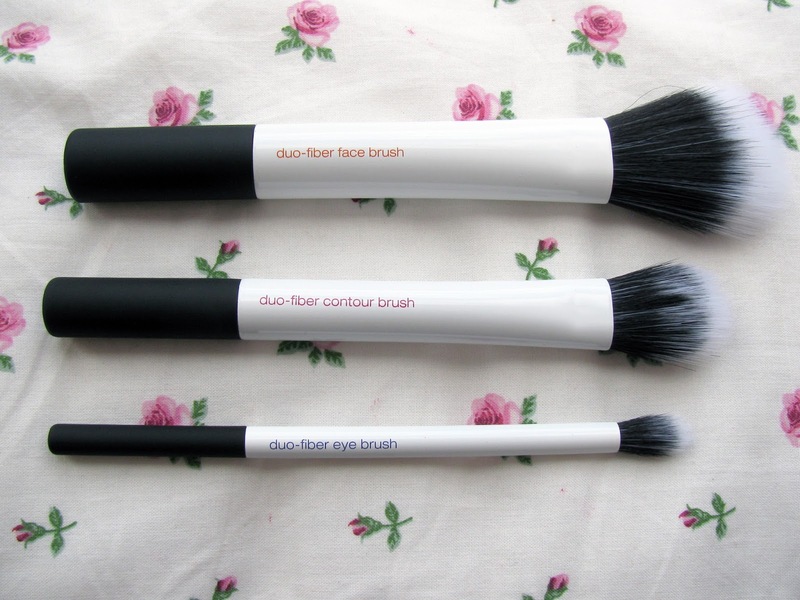 These brushes are described as ‘true multi-taskers’, as the duo-fiber bristles work with liquid, cream and powder based products for an unbelievable air brushed finish with each brush designed for different uses and application of products. The first brush in the collection is the Duo-Fiber Face Brush, which is designed for applying lightweight products to the face such as lighter foundations, BB cremes and powder based products. Just like most of the other Real Techniques brushes I own, I do not use this for it’s intended purpose. I actually use this to apply blush/bronzer when I want a really light coverage, otherwise I use my Real Techniques Blush Brush (review here). I find this brush gives a really nice and even finish to my cheeks and uses hardly any product to achieve this. The next brush is the Duo-Fiber Contour Brush, which is designed for controlled contouring and sculpting to define certain area’s of the face including the cheekbones and temples area. Now I was a little skeptical about this brush as I love my Real Techniques Contour Brush (review here) from the Core Collection but i’m actually quite impressed. I find this brush works just as well as my other contour brush, but allows me to define area’s of my face a lot better whilst using hardly any product whatsoever. It gives a really flawless finish, which I love especially if i’ve made a little more effort with my make-up. The last brush in the collection is the Duo-Fiber Eye Brush, which is designed for adding those finishing touches to any eye look. As I don’t normally wear eyeshadow on a day to day basis this brush has been a little neglected and to be honest I don’t think i’ll get much use out of this brush, which is a shame. I’ve used it a couple of times to basically blend my eyeshadow to make it look neater and more finished but I did find the brush to be kind of uncomfortable on my delicate eyelid. I need to see if I can find another way to use this brush as it’s such a shame otherwise. All in all I am really impressed with this collection, as I am with all of the Real Techniques brushes that I own. As this is a limited edition collection and will only be around for about a year (as I tweeted RT about this), I would advice buying this collection sooner rather than later, if you were thinking about buying this. Have you got your mits on this collection yet? Designer, Fashion Grad, tea lover and self confessed shopaholic.